Electric hoverboards are a lot of fun to ride which explains why they became popular so quickly, not just among children and teenagers, but also among young adults. Note that the term "hoverboard" is a misnomer, because these contraptions don't really hover, but move on wheels. A more correct term would be "self balancing scooters". However, we will keep using the term "hoverboard" in this article to save space and keep up with the trend. Though hoverboards are fun to ride, they can also be dangerous if they were cheaply made. Indeed, there have been many instances of hoverboards exploding or catching fire because of cheaply made batteries. Nowadays, it is not recommended to buy electric hoverboards that were not able to get UL 2722 certification which ensures among other things that the batteries are properly built and properly shielded. Note that the SWAGTRON hoverboards that we will be comparing here are all UL 2722 certified. Each SWAGTRON electric hoverboard is a self-balancing, personal transporter that uses gyroscopic technology to revolutionize the way you travel. Steering and stopping are controlled by Dynamic Equilibrium based on the shifting of your body weight. It’s simple to operate, easy to control, and looks very cool! ​Being an electric zero emissions product, each SWAGTRON hoverboard is environmentally friendly and uses only the highest quality components and industry-leading safety features. SWAGTRON electric hoverboards that are most popular among Amazon buyers are the T8, T580, T6, T5 and T1. This article will provide a detailed comparison of these hoverboards so you can easily make the right choice that corresponds to your needs. Note also that at the time this article was written, these hoverboards had received excellent reviews from most Amazon buyers with an all-model overall average rating of 4.5 stars out of 5 stars!. T8 has a Lead-Acid battery. T580, T6, T5 and T1 all have Lition-Ion batteries. T6: ADC10 Aluminum Alloy Casing. T1: ADC10 Aluminum Alloy Casing. Note that a charger is included with all models. Speed & Riding Style: Keep a moderate and consistent speed. Frequent starting, stopping, acceleration, and deceleration will reduce riding range. Weight: The weight of the rider can influence the range per charge. Temperature: Avoid environments that are too hot or too cold, as the engine may decrease power to protect itself, reducing range per charge. When you lean forward, it will sense your action and accelerate. When you need to turn, you slow down and gently shift the weight on your left or right foot to turn towards the opposite direction. To stop, you just need to stand in an upright, straight position. Finally to step off the hoverboard, you need to make sure the hoverboard is completely stopped, then step back with your dominant foot and quickly step off with the other foot. T8 has a single riding mode (no riding mode selections). T580, T5 and T1 all have two riding modes: a Learning mode and a Standard mode. T6 has three riding modes: a Learning mode and a Standrad mode and an Advanced mode. Learning Mode: It is ideal for new or inexperienced riders. It controls the maximum reachable speed of the hoverboard, so you can practice balancing and general movement. Standard Mode: It should be selected by more experienced riders. It removes the learning mode restriction and allows the unit to reach higher speeds. Advanced Mode: This mode removes all speed restrictions and should only be used by advanced riders. You can switch between Learning and Standard Mode directly on your smart board by first pressing the power button to power the board and then pressing the power button a second time. With the T580 and T6 hoverboards, riding modes can also be changed using the SWAGTRON App which is available in both the App Store and Google Play Store. Note that the T6 Advanced mode can only be activated using the SWAGTRON App. 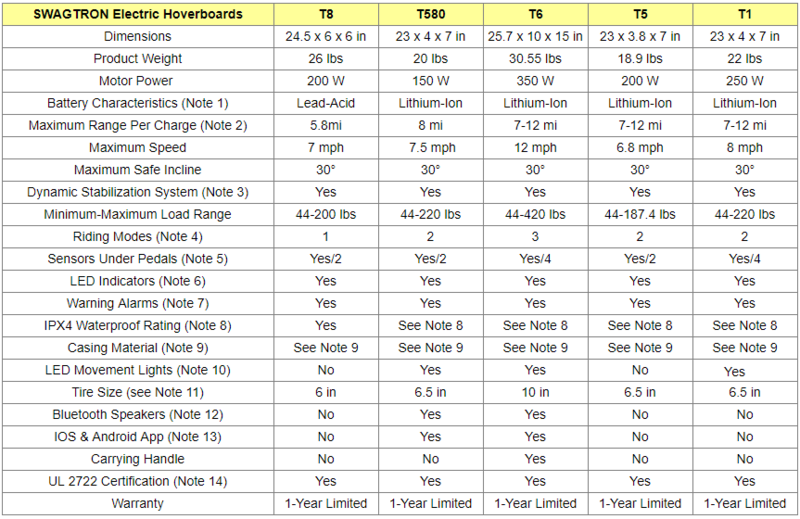 All SWAGTRON electric hoverboards have sensors under the pedals (see the comparison table above for the number of sensors in each model). When the rider steps on a pedal, the hoverboard will adjust itself to balance automatically. Note that when riding the SWAGTRON electric hoverboards, you must make sure both feet are touching the pedals so the sensors can properly be triggered. All SWAGTRON electric hoverboards are equipped with LED indicators to indicate system parameters such as the battery charge level. During operation, if the system encounters an error or is being operated incorrectly, these SWAGTRON hoverboards will alert the operator through an alarm or indicator LEDs. All SWAGTRON hoverboards considered here can withstand splashes. However, you should not submerge your SWAGTRON in water, and do not let water and liquids get into the unit's electric parts or battery. Note however that SWAGTRON T8 has been granted an IPX4 waterproofing rating which means it is capable of withstanding not just splashes, but also minimal direct contact with water. T1: Durable hard plastic shell with UL approved material. T5: Durable hard plastic shell with UL approved material. T6: Aluminum & durable hard plastic shell with UL approved material. T580: Durable hard plastic shell with UL approved material. T8: Durable steel shell with UL approved material. SWAGTRON T1 has blue LED lights across the front. SWAGTRON 580 has a blue LED lights across the front and a red lights across the back. - Red lights indicate slowing/stopping, unexpected pauses, or sudden movements. Red LED lights illuminate on the rear of the board when coming to a stop from forward motion. Red LED lights illuminate on the front of the board when coming to a stop from backward motion. - Blue LED lights on the front of the board indicates forward motion. - Green LED lights on the front of the board indicate turning direction. T1, T5, T580 and T8 have all hard rubber tires and aluminum-rimmed wheels. T6 has tubeless nylon tires and aluminum-rimmed wheels. T6 and T580 are both equipped with speakers and support Bluetooth connectivity. So the hoverboard's speakers can use Bluetooth to play music directly from your phone while you ride. With SWAGTRON T6 and T580, you can download to your smartphone the free SWAGTRON App which is available in both the App Store and Google Play Store. You can use the App to select the riding modes, check your speed, monitor battery status, play music, etc. UL 2722 is a specific certification targeting electric hoverboards. The certification specifically marks hoverboards that are not in danger from exploding or catching fire due to internal complications. In other words, UL 2272 certification enables the sale of quality standing safe hoverboards. If the hoverboard you are considering is not UL 2722 certified, you should not buy it as it may catch fire under certain conditions and situations. Now that you have all the characteristics of all these electric hoverboards offered by SWAGTRON, you should be able to select, in the Amazon products section below, the one that best matches your requirements or the needs of your child or teenager. So, which SWAGTRON electric hoverboard to choose? If you are heavier than 220 lbs, you should definitely go for the T6. If you want to control your hoverboard using your smartphone, or if you want to listen to music coming out of your hoverboard's speakers, you should consider either the T6 or T580. Though the batteries of all 5 models are well shielded against fire, if you prefer to have a Lead-Acid battery rather than a Lithium-Ion one, or if you want a hoverboard with a chassis built of steel (rather than hard ABS plastic) with IPX4 waterproofing rating, you should go for the T8. If you want your hoverboard to be equipped with movement indicating lights, you should consider the T1, T6 or T580. If the above points are not essential for you, and in particular for younger inexperienced riders, you may want to consider either the T1 or T5. Wear appropriate clothing and safety gear including knee pads, elbow pads, and an ASTM safety certified helmet for all riders of all ages at all times. Avoid wearing anything that can drape over or get caught into/under the wheels. Wear flat shoes to maintain flexibility and stability. When going through entryways, remember that you are taller. Keep your feet on the pedals. Taking your feet off the SWAGTRON while riding is incredibly dangerous. When riding near others, keep a safe distance to avoid collisions. Be aware of your surroundings at all times. Your eyes are your best tools for safely avoiding obstacles and unsafe surfaces. Ride on even pavement or smooth roads. While riding, relax your legs and keep your knees slightly bent. This helps maintain balance when you encounter uneven ground. Stay in open spaces and flat areas. Avoid steep slopes or high traffic areas until you’re familiar with riding. Ensure your speed is safe for yourself and others and be ready to stop at any time. Your SWAGTRON hoverboard can only support the weight of one person at a time. Remember, only ride your SWAGTRON where it is permitted. You MUST comply with local laws and give way to pedestrians. ​Read carefully the SWAGTRON user manual and all the safety recommendations described therein before riding your SWAGTRON for the first time . T8, T580, T6, T5 and T1 SWAGTRON hoverboards are all available below on Amazon. Please click the hoverboard of your choice below for price information or to purchase. When you click the Amazon link images below, you will get additional colors to choose from whenever available. Note: Amazon often provides a good discount on the List Price of sold products. If a discount is available, the List Price and the actual Amazon price will be shown when you click the product link images below. If you'd rather have an electric scooter, you might want to consider also the SWAGTRON electric scooters which are equipped with an LED screen that allows sophisticated runtime controls (such as cruise control) and runtime diagnostics display. For a comparison of SWAGTRON electric scooters, please click: Comparing SWAGTRON Electric Scooters.